MEXICO CITY —Bicycling is having a boom in Mexico City. There are thousands of commuters and dozens of recreational biking groups that take to the streets at night and ride around in a group. But after the recent devastating earthquake, a group of bikers have been collecting supplies to send to Oaxaca and Chiapas, the areas most affected by the earthquake. They then converted this network that already existed to bring supplies to rescue workers and aid centers. Many bike shops in the area have put up signs offering free mechanic services to bicycle volunteers. 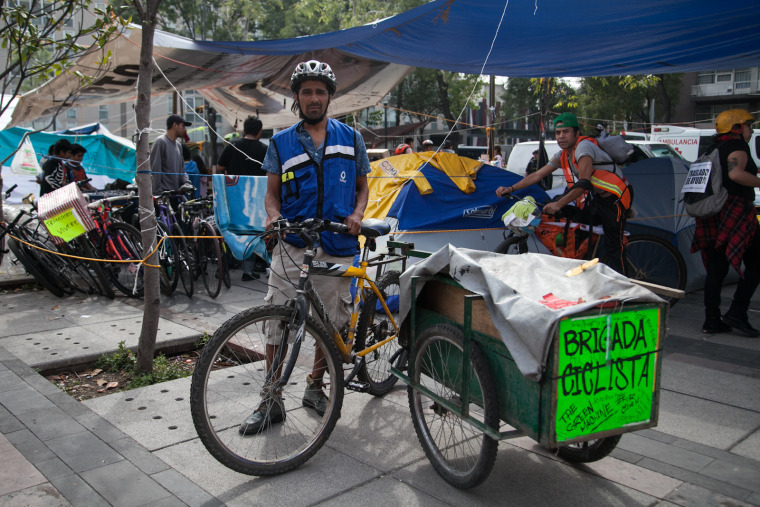 Throughout the weeks new groups of cyclists come and go from two convergence centers set up in the Roma neighborhood, near Mexico City. They fill their backpacks with supplies and take off, at times wearing traffic vests and phrases written on their helmets. There are designated volunteer coordinators who check the needs of the aid centers and rescue sights and let cyclists know what needs to be delivered. They work alongside all the other volunteers who are organizing medicine, food for humans and food for pets, water, first aid supplies, and construction equipment. We traveled with a brigade to a site that was established on a bridge over a Viaduct next to a building that had collapsed. There was no longer anyone working in the building and in it's place were over 10 wreaths for the people who had died there. No official list has been published that I have been able to get a hold of. Rafael Mendoza, one of the cyclists, filled up his cart with a few dozen bottles of water to bring to the aid center and 10 people rode with him with water and other supplies in their backpacks. He has been delivering every day for 12 hours, and looked very tired but kept going. He had a large cargo bike so he could carry a heavy load. He had planned to travel to Juchitan, Oaxaca to help out with the people who were affected by the earthquake there but then decided to stay in Mexico City to help out. He normally uses the tricycle to transport compost and earthworms. "It is something very tiring, but makes you feel very satisfied," said Mendoza. He had been to the hospital Balbuena, to bring sandwiches and other food to families waiting outside the hospital for loved ones who were injured in the earthquake. Why bikes, we asked. "With my bike I can fit through tight spots which allows me to get around much faster than with a car," said Mendoza. "In the areas where there are collapses we can get through via bicycle." He said he would do this as long as his body held up. He said he hadn't seen as much help from the government, but was impressed with civil society's response. "I thought people would just act selfishly but civil society and organizations have come together. I came by myself and I joined in here with many different groups. It is really wonderful the response people have had." Mari Carmen Cortes is a biker that is part of an urban bike group Los Eslabones that means The Links. "Bicycles have been very useful to transport things to areas where vehicle access is blocked off and where you can transport very specific things." "When they needed things urgently, we transported them by bike because it was much quicker because of all the chaos and traffic in the city," she said. "We can't carry too much with our backpacks, but when we go with 20 people we can carry much more." Cortes was constantly checking her phone, as she coordinates five different Whatsapp groups all trying to distribute supplies, food and medicine to the different shelters, rescue sites and donation centers and she is coordinating with cyclists who are helping out. They tell her who needs medicine, food, or supplies. They send her a video of the person making the request with the time and location so she can verify. When they are not completely sure they send a brigade to verify before sending a group of cyclists with the supplies. "This is my little grain of sand of what I can do. It is impossible to just remain static and not doing anything when faced with this situation," said Cortes. Gustavo Magallanes is a professor at the Universidad Nacional Autónoma de México (UNAM) who has been volunteering with university brigades and cycling brigades since the earthquake hit. He recalled one of the days following the earthquake. "There was an enormous line of cars entering the university campus to deliver adrenaline and insulin to the rescue sites but we realized that they were very slow, so we the cyclists started delivering ice to keep the medicines cold. On bike we were able to more quickly deliver the medicine and ice than people in cars. "